Black and Red Prayer Rope Bracelet Featured! We all have heard the saying, “Don’t judge a book by its cover” and even though no one should be doing that, first impressions are everything. That’s why 33Knots has teamed up for another photo shoot with photographer, Brian Dexter, to bring you a guide of making a lasting impression with your clothes. First hint is if your wardrobe is unappealing, chances are you’ll be overlooked, even if you have a charming personality. That’s why it’s important when you interview for a job, go out on a first date or attend some kind of business meeting, you make an impression. You don’t want to fade into the background with the rest of the people around you. You want to shine like the brightest star in the sky, to stand out and make sure that people remember you. So, how do you make an impression with just your wardrobe? It’s simple! Use the three prominent power colors: black, red and white. Now, some will argue that the power colors are for business only, but let’s not kid ourselves. The psychology of color is used in almost everything you look at from billboards to the center color of someone’s office. So, using them in your wardrobe is not excluded. For example: take a look at the model in the pictures above. Her loose tank top is white, her maxi skirt is a bold red and her pumps are black. When you look at her outfit, the three prominent power colors, how does it make you feel? Take a moment and analyze. Here at 33Knots, we know you may be wondering exactly what do these three colors symbolize in the psychology of color. We’ll start with the color black. Black is a bold color. It’s seen as a color of authority and intimidation, yet at the same time, sophistication and a sense of mystery. The model is wearing black pumps, adding just that little bit of seriousness and obscurity into her outfit. Now, red is a bold color like black. It’s seen as passion and strength, as well, dominance and caution. 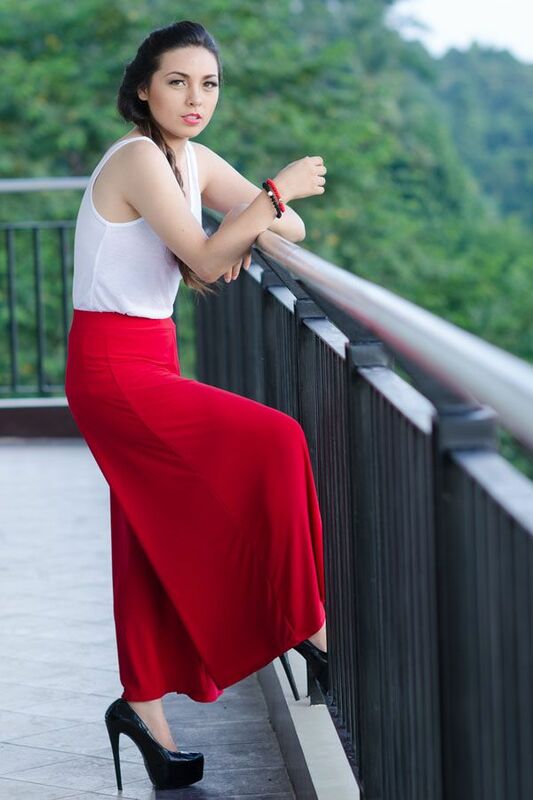 Overall, red is the attention grabbing color, it demands attention, hence the models maxi skirt being the focal point of the outfit. Last but not least, white is viewed as equality and simplicity color, not to mention, coldness and detachment if white is the dominant color in the outfit. The power of color tips aren’t just for clothing. It can be used for accessories too. Let’s say you’re wearing a green dress. Green is seen as a color for harmony and nature and for greed. 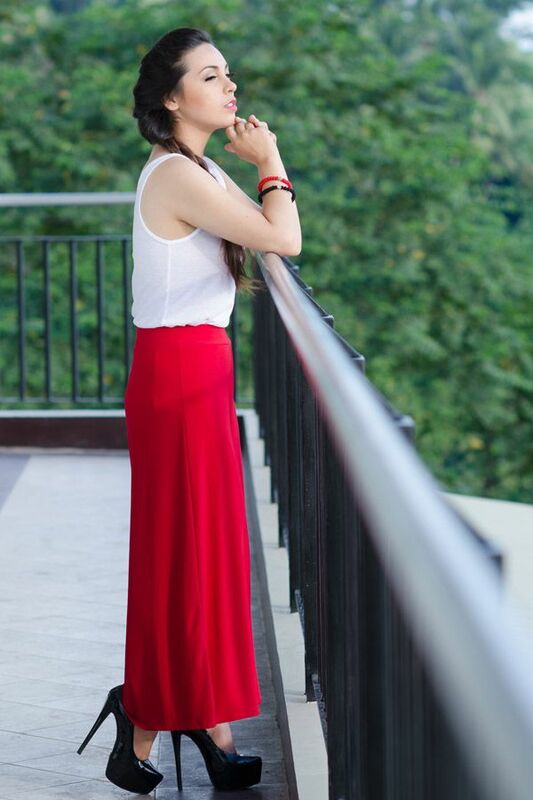 Now, maybe you want to signal something more in your outfit, simply stick with black and red accessories, like the model wearing black and red prayer rope bracelets in the picture above. Since the bracelets aren’t overwhelming, they strike the conclusion as sophistication and strength. Take your time finding the right combination of black, red and white that suites not only your personal preference, but the message you want to get across while leaving an everlasting impression. The black and red prayer rope bracelet is available in our store!